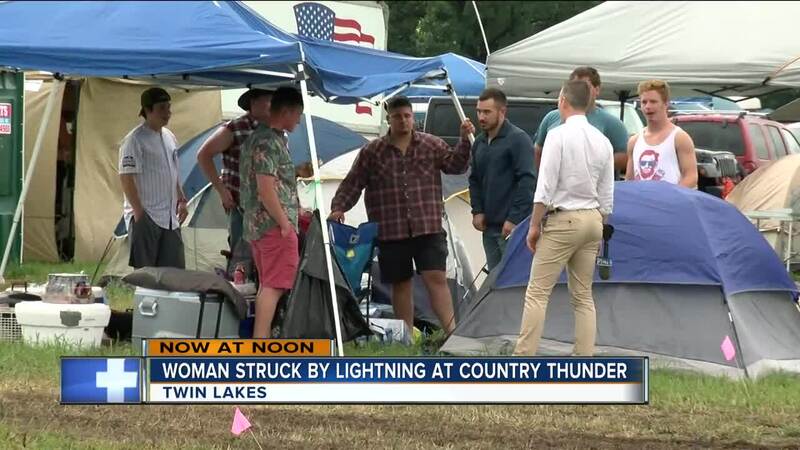 TWIN LAKES -- A woman who was struck by lightning overnight at the Country Thunder Music Festival grounds has been identified after deputies initially weren't sure who she was. Deputies say 22-year-old Brittney N. Prehn is from Illinois. She has been transferred to the Loyola University Medical Center with serious injuries. Deputies were called to the campgrounds just after 12:30 a.m. Friday for a medical emergency, where they found the woman unconscious but still breathing. Campers around the area were trying to piece together what happened overnight. "I just heard a huge lightning bolt," Robert Kruse of Illinois said. "Me and a friend walked out and every cop rushed over there. Her shoe exploded off, her other shoe was all black and burnt. She had blood coming from her ears." Those around where she was found are feeling lucky it wasn't them. The powerful storms came through as they scrambled to find shelter in tents. "I feel lucky," Thomas Wiskarchen of Elgin, Illinois said. "I'm really close to where this happened. It could have happened anywhere. We heard a lightning strike and it sounded close like a mortar went off underneath our tent." "It was pretty scary honestly," Nick Bauer of Elmhurst, Illinois said. "It happened a few times. A lot of thunder and right by us, huge cracks." 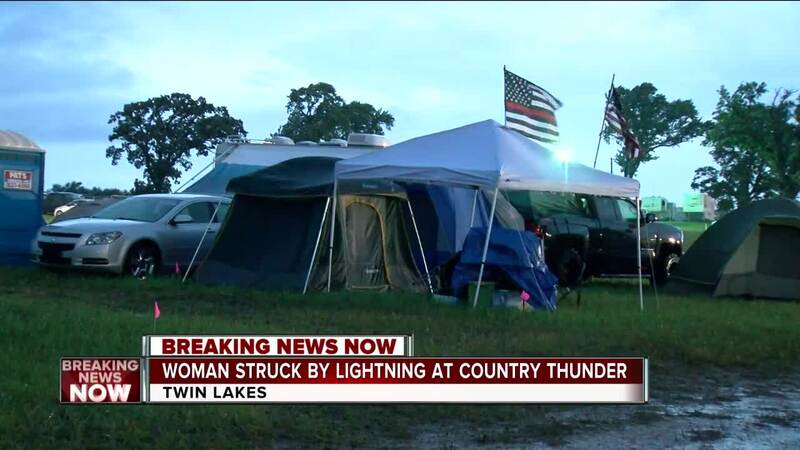 Campers say the lightning strike was close to a black pickup truck. They say the owner of that truck had the electric inside ruined and couldn't start his vehicle. Prehn wasn't carrying any identification on her at the time, so deputies weren't initially able to identify her. She was alone at the time of the incident. It is a difficult situation to be in for campers. When a thunderstorm comes through, they don't have many safe options to seek shelter. Tiny tents make up the majority of living space at Country Thunder. However, law enforcement says to try and be neighborly if you have a safe spot for people to seek shelter. "If someone with a larger vehicle can accommodate them, head over there and see if you can work together and gain some assistance from other folks here camping," Sgt. Tony Gonzalez with the Kenosha County Sheriff's Department said. "Mother Nature is pretty unforgiving at times. It's unpredictable at time sand happens quite fast. Try to do the best you can in conditions you're in. If you're in need of help, reach out to law enforcement or call 911. We'll do our best to rescue you as well."